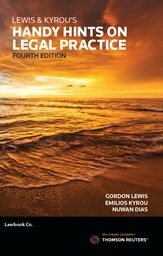 Lewis & Kyrouâ€™s Handy Hints on Legal PracticeÂ Fourth Edition, is an easy-to-read and informative guide to practising law.Â It assists new practitioners to acquire vital skills and provides more experienced practitioners with succinct and practical summaries of key principles relevant to day-to-day practice. The comprehensive content in this work ranges from establishing effective client relationships and efficient office systems, to confidentiality, client legal privilege, conflict of interest, liens, costs, undertakings, precautions against negligence, court etiquette, contempt of court, without prejudice privilege and unprofessional conduct. The Fourth Edition has been updated and many chapters have been substantially rewritten. Matters considered for the first time or in greater detail in this edition include: client legal privilege and without prejudice privilege in the light of the Uniform Evidence Law; a practitionerâ€™s relationship with his or her client, other practitioners, the profession, the community and the courts in the light of the: Â Legal Profession Uniform Law; Â Legal Profession Uniform Conduct (Barristers) Rules 2015, and Â Australian Solicitors Conduct Rules 2015, conflicts of interest, a practitionerâ€™s duty to the court and his or her duty to fellow practitioners; for litigation lawyers - issues such as dealing with witnesses, conducting a case, as well as preparing for and instructing in court; for transactional lawyers - issues such as precautions against negligence, and common mistakes in property and commercial matters; drafting issues arising in relation to retainers, briefs to counsel, written submissions to a court, terms of settlement, letters of demand, pleadings, affidavits, witness statements and commercial documents; the effect of technological advances on legal practice, including mobile technology, digitisation, social media, powerful internet search engines and cloud-based computing; and Â considerations when establishing and managing a relationship with an outsourcing provider. Lewis & Kyrouâ€™s Handy Hints on Legal PracticeÂ Fourth Edition confirms this workâ€™s position as an essential purchase for all practitioners in common law jurisdictions.